Derek Jarman’s Blue, projected in what used to be an X-Ray theatre, the front line of penetrative medical vision. Prior to entering the installation, there is a display of Ophthalmic equipment used for calibrating sight defects and retinal diseases such as CMV (Cytomegalovirus) from which Jarman suffered. 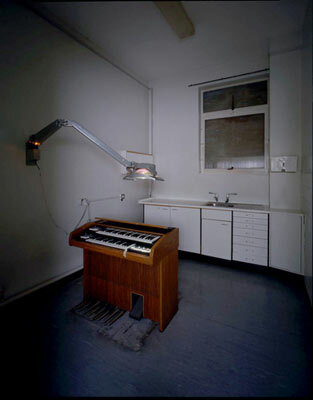 Remodelling Medical History, Part One: Histories by Jo Spence and Terry Dennet, is a photographic work installed in dilapidated changing cubicles. It combines a range of material from the Jo Spence Memorial Archive (curated by Terry Dennet) looking at the different effects of cancer treatments both on the patient and within the medical establishment. 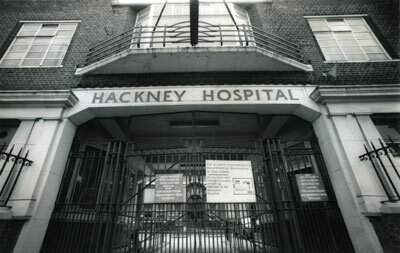 Giving an unexpected view of provision, Hackney Hospital: Abdoscan by Catherine Yass uses an ultrasound machine to display a video of the labyrinthine service tunnels running underneath the building. Patience, suspense and incarceration are the focus of Jason Coburn’s Service, where a ball is repetitively thrown from a concealed room, its source remaining incorporeal, its aim obsessive. Included in Notes Towards a Possible Museum are a range of potential Museum Displays. These include a mise-en-scène of an X-Ray theatre, whose traces of disconnection have been conserved; found objects conserved and presented in protective polythene; a cleaning room containing a reclining side-opening bathtub; and table-top display cases whose contents trace the evidence of activities taking place within the hospital. The Reading Room combined texts on the care, treatment, and management of the patient, with loaned material idiosyncratic of the people who have contributed and helped to make Care and Control possible. 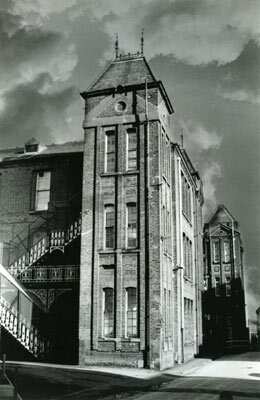 To commemorate the passage of the thousands of people who came through the X-Ray Department, the files currently stored in the unit will be compiled and taken to a new location at Homerton Hospital. Starting of the 27th of June, the removal will cover a four to five week period and be on full view of the viewers.